Malware researchers can no longer count the number of justplugit applications released to this date. Unfortunately, CouponBuilder is one more program you can link to this family. In fact, it does not take much to create slightly different copies of the same program over and over again; however, the advantages of this practice are obvious. If you do not remove CouponBuilder, the application will ensure that you face different pop-up and banner ads whenever you launch the affected browsers and surf the web. The name of the devious CouponBuilder was not created randomly. The application is usually distributed via software bundles, which means that most users introduced to the program know nothing about it. If they search the web, they are likely to land on couponbuilder.com, and this is not the website representing the unreliable adware that must be deleted. The clandestine extension is promoted at couponbuilder.info, and the interface of the site has various similarities with the websites representing CouponTime, SaleBuilder, SharkShopper, and other unreliable ad-supported programs based on the justplugit engine that require removal. 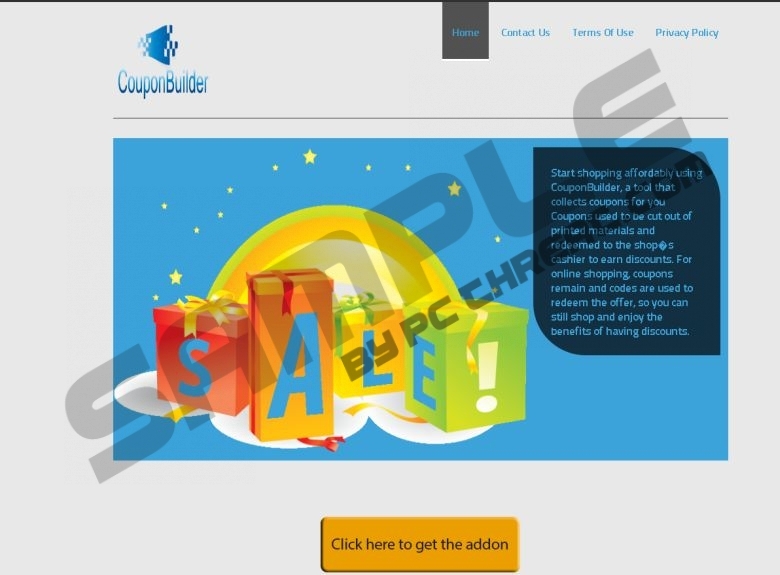 CouponBuilder has been designed to communicate with third-party advertising servers. Even though it is suggested that the program is meant to collect coupons and then show them to you, it is much more likely that the application will display random ads linked to specific adware servers. You must delete CouponBuilder because it is unlikely that this application will present any beneficial offers. On the contrary, it could present ads linking to malicious websites, and aiding cyber criminals! Are you hesitant about CouponBuilder removal? Most users do not hesitate at all simply because the program is useless. As mentioned already, CouponBuilder is usually distributed by third parties because the installer on the official site couponbuilder.com has been deactivated. Some malware researchers suggest that the program has not been launched yet; however, if it wasn't, you would not need to worry about CouponBuilder removal. Overall, if adware is active, it is almost guaranteed that other malware is active as well. Adware distributed by Installrex, Amonetize, Vittalia, and similar parties is usually installed with programs that require removal. Are you confused about CouponBuilder removal? You might be if you are not experienced, or if you are unfamiliar with justplugit programs. In order to delete CouponBuilder successfully, you have to uninstall the program and remove all leftover files. Not to mention the additional threats that may deserve removal as well. What should you do to succeed? Install reliable malware removal software that deletes infections automatically. In the presented menu double-click Add or Remove Programs. Tap the Windows key on the keyboard to access the Metro UI screen and right-click on it. Select All app (opens Apps menu), then select Control Panel and Uninstall a program. Right-click and Uninstall the application you have chosen to delete from the PC. Quick & tested solution for CouponBuilder removal.